Meet 9.45 for a 10am start. Remember clocks are going forward on saturday! Cost £5 for the day. There is road laybys on honister pass but they are not very near the carpark and require a bit of ascent to get to the start. Alternatively if you go to Honister Slate Mine car park (not National Trust) it only costs £3.50 - you can buy tickets inside the slate mine. First we head to Great Gable along the disused tram path to drum house, over the stile taking the Moses Trod route round the flanks of Green Gable and Brandreth with views of south of Ennerdale. This is a steep start which flattens out (it is not as bad as it looks) but can be a little boggy in wet weather. At Beck Head we ascend the rocky face of Great Gable. The path is an easy scramble and not exposed (approx 200m). At the summit the best views of wasdale are from the westmoreland cairn. We return by following the ridgeline in the direction of the carpark. First descending to Windy Gap then a short reascent to Green Gable, then along to Brandreth and finally Grey Knotts and the path brings us out right by the car. Options for refreshment at the cafe at honister slate mine or pub in Seatoller or Rosthwaite. 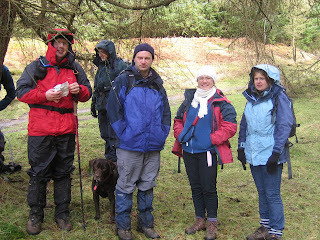 Incase of very bad weather or snow for those without winter gear there will be a low level walk around Borrowdale Valley. 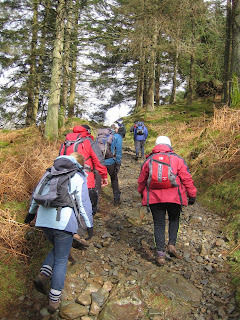 A varied walk with a bit of scrambling in the Northern lakes. Walk begins alongside the river for a gentle start, before beginning our ascent to Bannerdale crags, this goes past some mine workings and finishes with a scramble to the top. There are then great views as we walk along the top of the crags to the top of Bowscale Fell. We descend slightly to below the tarn and pick up a gentle track to the village of Bowscale before following the minor road back to Mungrisdale. Start: 10 am at track in Mungrisdale by the phone box (NY 362304) If lane is full there is some parking earlier on road opposite community centre. Both ask for donations of £2. P.S. If you fancy a wild camp on the Saturday night at Bowscale Tarn please contact me too. Will probably only go ahead with decent weather forecast. 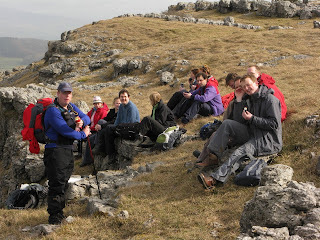 A relatively undemanding walk in some interesting limestone country between Kendal and Kirkby Lonsdale. With good views from the top of Farleton Knott (everyone must've seen it whilst driving up the M6) looking west and from Hutton Roof crags looking east. 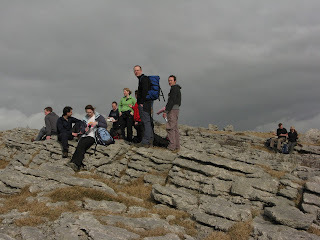 Although not too difficult, some of the walking may be on slippery limestone if it's wet. 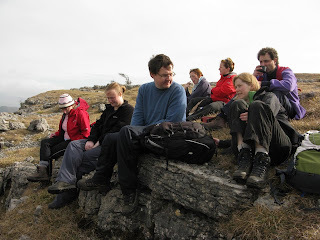 Start: 11 am at Plain Quarry car park near Burton in Kendal. SD 552 761. Just south of Burton on the A6070 take the road sign posted Kirkby Lonsdale/ Hutton Roof (Dalton Lane) Plain Quarry is about 1.5 miles up on the left. 7pm start at Emma's in Kendal. NOTE: The forecast says it will be cold and windy, so make sure that you have plenty of warm clothes with you. NO jeans. If the weather is really bad, we will do a lower level alternative route. Description: From Sadgill, we head up to Shipman Knotts, Kentmere Pike, and Harter Fell, then descend to Gatescarth Pass, up to Branstree, then return along the valley bottom. Start: 0945 at Sadgill, at end of tarmaced road, at the northern end of Longsleddale, Grid Ref NY 483056. Click here for a map. Parking is limited, so please car-share if possible. 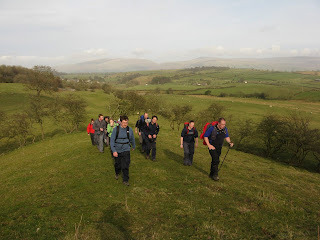 This is a walk over one of Wainwright’s favourite fells. The walk starts with a steep ascent of Carrock Fell from Stone Ends to reach the Iron Age hillfort on the summit. The broad ridge of the fell leads to High Pike with cracking views over the Solway Coast. We will continue past Lingy Bothy and descend to the Caldew Valley via Grainsgill Beck. The last 4km are along quiet roads through the valley. There is an optional detour to visit the beautiful Bowscale Tarn, which is well worth the 230m grassy climb, but as this is towards the end of the walk some persuasion may be required (go on, you know you want to).